Palestinian officials warned, on Thursday, that the financial crisis facing the United Nations Relief and Works Agency for Palestine Refugees (UNRWA) is part of a scheme aimed at ending the Palestinian refugee issue. UNRWA sent, on Wednesday, work termination letters to 1,000 of its Gaza-based employees who were working on contract bases, citing financial reasons for its action. 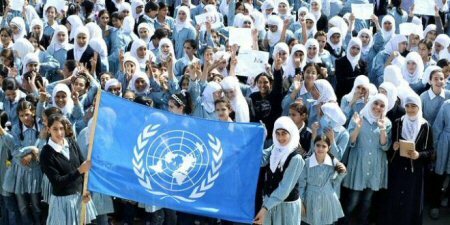 At least 20,000 others are also under threat of termination after UNRWA reported over $200 million deficit following a decision by the United States, the biggest donor to UNRWA, with $300 million a year, to significantly slash its annual contribution to punish the Palestinians for refusing to accept its so-called “peace plan”. Hundreds of UNRWA employees demonstrated in Gaza, at the agency’s headquarters, against its dismissal policy. Speaking on Voice of Palestine radio, Saleh Rafat, member of the Executive Committee of the Palestine Liberation Organization (PLO), said UNRWA should not be blamed for what is happening, but rather the US, for cutting the agency funds and pressuring other countries to do the same, as part of pressure on the Palestinian Authority to give in to its and Israel’s dictates. Spokesman for the Fateh movement in the Gaza Strip, Atef Abu Saif, also told Voice of Palestine radio said that UNRWA’s decision to end the services of a number of its Gaza employees comes within the policy of gradual reduction of its work, which is part of a larger plan aimed at ending the refugee issue. He said that the international community is pushing Gaza into further economic deterioration in order to pass the American deal.